Every once in awhile you just have to stare at yourself in the mirror after a hard day at work and with a slanty eye and coy grin chant “I’m going to treat myself!” There is no better place in Toronto to indulge than at one of the cities many luxurious spas. The urban oasis offers a quintessential multi-sensory experience: smooth ambient music sets the vibe, dim lighting relaxes the mind, massage loosens those muscles, the smell of eucalyptus in the steam room soothes and a refreshing chai tea provides a perfect conclusion for the palate. So I set myself on a mission to force myself to rest and relax in Toronto. My intention was to explore the cities finest urban retreats and sample their best signature treatments. This story is an ongoing one so if you have any favourites feel free to drop them in the comments section below! Civello is Aveda’s leading lifestyle salon and spa originally opened its doors in Rosedale in 1989 with a mission to inspire guests to feel and look their best. The three-story space is much larger than you would expect after simply staring up at its pretty façade from Yonge Street. I start the morning with a polish to my fingers and toes via back-to-back mani-pedi. The room was quietly buzzing as I sipped a hot cup of herbal tea and watched as well coifed women caught up on neighbourhood gossip with their beauticians. Streams of light blasted through a bamboo framed window while calming Buddha bust, bronze lanterns filled with yellow posies and a trilogy of potted jade plants added a nice streak of colour to the space. I was then guided through a stone mosaic adorned hallway in petite disposable flip flops which offered a subtle foot massage on my way to the treatment room where I would spend an hour indulging in an aqua polish salt exfoliation treatment. I seriously snored during the spa’s signature Elemental Nature Massage. My friendly RMT offered customized Aveda aromas and deep tissue work that had me wandering home in a smug mug and sultry daze. The simply titled, “Spa” at the Four Seasons is a sun-filled urban retreat which rightfully-so-boasts the “largest luxury hotel day spa in Toronto,” with over 30,000 square feet of rest and relaxation. The Spa offers 17 spacious treatment rooms, two steam rooms, and a salon with ceiling to floor windows which allow guests perched in their seats for haircut or mani/pedi to gaze out at the posh and panache of Yorkville. The real gems here are a sunlit indoor relaxation pool, co-ed whirlpool and outdoor terrace where in the warmer months guests can sip and sigh. The Alpha Male Facial is a man-centric signature treatment perfect for gents looking to pamper themselves. Therapists use a variety of products from the Hungarian skin care line, Omorovizca which includes a cleansing foam, thermal cleansing balm, Queen of Hungary mist, deep cleaning mask and reviving eye cream. Located in the heart of Toronto’s Entertainment District, The Ritz-Carlton is ranked as No. 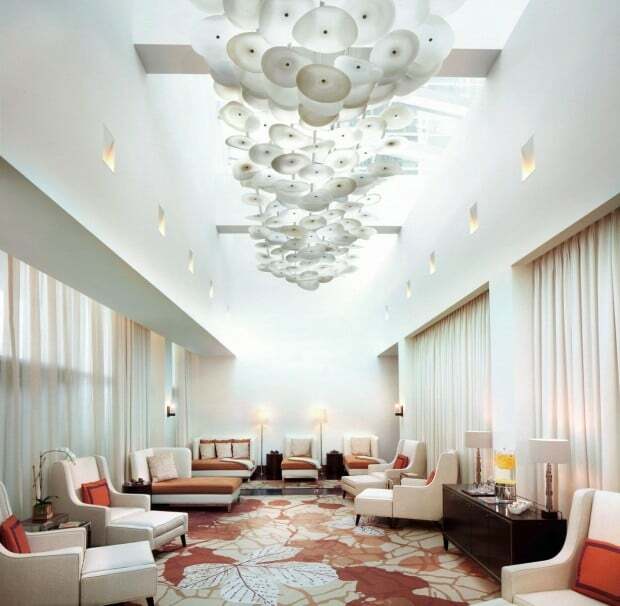 1 on the Travel + Leisure 2013 World’s Best Awards list of Top Hotel Spas Overall. 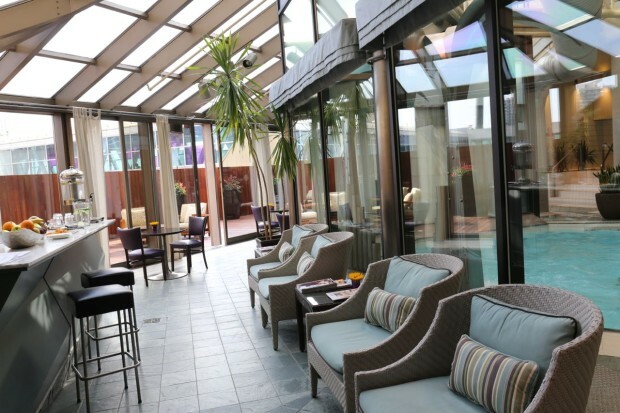 Located on the hotels 5th floor, guests waiting for their treatment can bask in the natural light of the Urban Sanctuary sunroom, a glass-enclosed retreat which offers jaw dropping views of the cities skyline. Enjoy a decadent Champagne Nail Bar with lux pedicure stations, tranquil city-view lap pool, oversized aromatherapy steam room, saunas and green tea-infused vitality pool. Spa My Blend by Clarins offers a comprehensive selection of face, body and massage treatments in 16 exquisitely appointed private rooms. The spa’s signature treatment is a 60 minute My Blend Facial, an ultra-personalized experience which begins with a thorough skin and lifestyle analysis. Based on the results of the consultation, a unique blend of customized products including essential formulas and booster serums are produced to offer guests a unique menu which includes: Oil Crisis Control, Early Age Alert and Potent Age Antidote. 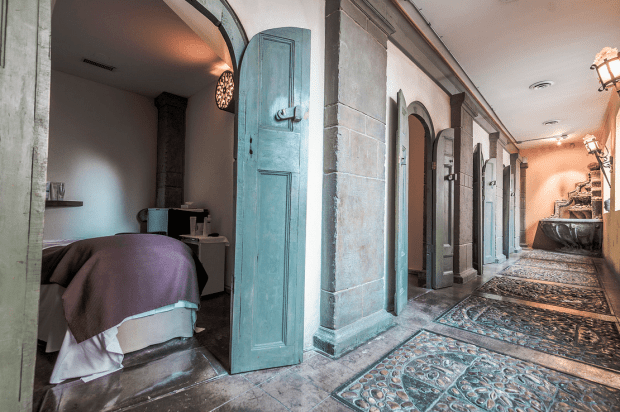 Located in Toronto’s towering Shangri-La Hotel, Miraj Hammam Spa by Caudalie Paris offers a unique urban oasis for those looking for a bit of rest and relaxation. 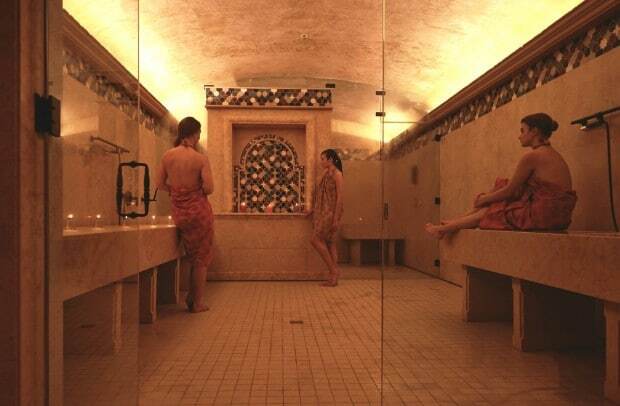 In centuries past, the Hammam was known as a silent doctor. Now in Toronto you can indulge in traditional Hammam and Gommage, the properties signature treatment. De-stress between a private high intensity and low mist steam chamber, the Hammam cleanses the body while stimulating your senses. Lay relaxed on Jerusalem gold marble and experience an invigorating full body Gommage (exfoliation) using eucalyptus infused black Moroccan soap. I recently adventured through Turkey in September and will never forget my first traditional Hammam experience in the seaside village of Bodrum. Save yourself the arduous flight and take your imagination on a multi-sensory journey via authentic Middle Eastern traditions at Toronto’s own Caudalie Paris. Toronto’s ultimate boutique spa experience can be found at the Hazelton Hotel in the heart of Yorkville. The Spa at the Hazelton is an intimate space with only four treatment rooms and one mani/pedi station. An ideal setting for small groups, couples, friends and individuals looking to rejuvenate in a discrete setting. Both the ladies and gents change rooms are equipped with eucalyptus steam rooms while a salt water lap pool offers guests a space to relax and soak after their treatment. RMT’s who perform the Hazelton’s signature massage are encouraged to individualize each treatment to match the clients unique needs, whether they are more therapeutic, healing or simply for relaxation. Therapists use Holly Oil, adding aromas which are tailored to each guests preference. A specially formulated Hazelton Tea blend is also offered to all guests, a soothing herbal sipper perfect for keeping the calm and carrying on. A stones throw from the hustle and bustle chaos of Dundas Square, Elmwood Spa offers a quiet calm for those looking to rest and relax in the heart of downtown Toronto. 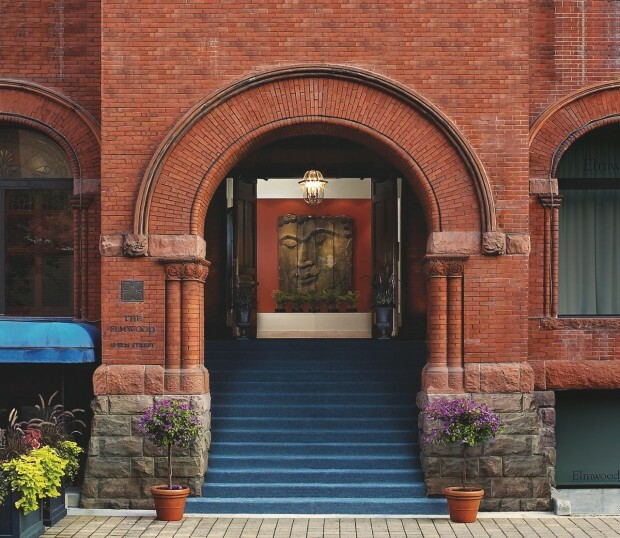 The spa is located in a stunning historic five-story brick building originally designed by Gordon & Helliwell Architects – the same team in charge of the cities much loved Old City Hall, St. Paul’s Anglican Church and Casa Loma. It’s subtle Thai theme begins with a large carved Buddha at the entrance and continues throughout its 34 treatment rooms. Elmwood is the cities largest spa, employing over 60 RMT’s and accommodating over 20 massages at any given time. Their signature treatment is a dreamy Deep Siam Massage which features heated Thai herbal compress filled with aromatic lemongrass, plai, tumeric and Kaffir lime. Located in the chic Intercontinental Toronto Centre Hotel, The Spa is the perfect destination in the heart of the city to unwind. Guests are greeted by an indoor saltwater pool featuring petite waterfall, elevated hot tub, spacious lounge featuring dried and fresh fruit for snacking and deck ideal for tanning enthusiasts. The Spa’s signature treatment is a unique Table Thai Yoga Massage. This ancient and dynamic form of bodywork uses a blend of rhythmic rocking, yoga-like stretches and targeted acupressure techniques to release stressed joints and loosen tense muscles. The treatment is performed fully clothed and can be followed by an add on stimulating tonic-infused scalp treatment perfect for hair hydration.